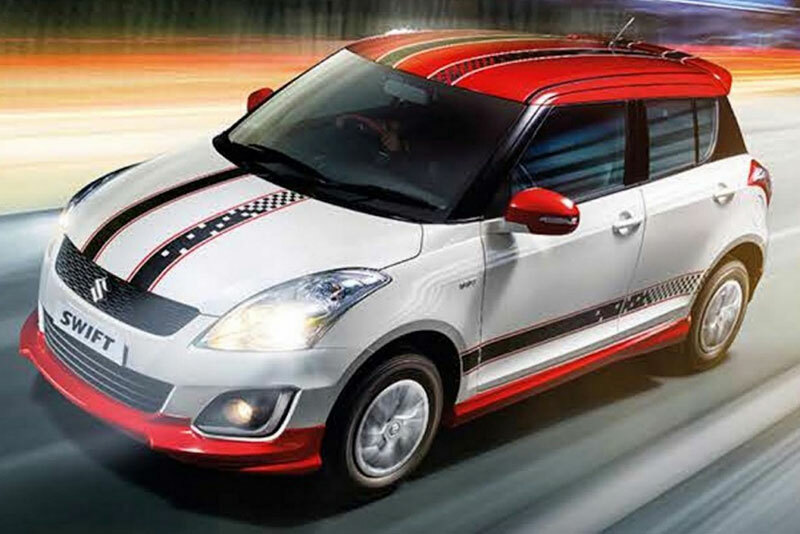 Country’s popular car Maruti Swift whose sales have crossed 13 million units in India since its launch has released a new variant of Swift calling it as “Glory Edition”. Seems like every automobile manufacturer wants to make the most out of festive season, and Maruti Swift limited edition Glory is a move to capture the occasion of festival. Suzuki Swift’s ‘Glory Edition’ adds new and best-in-class features to the car providing more premium value to the hatchback. This Glory Edition of Maruti Suzuki Swift features upgrades not only to the outsides but to the interiors of the car as well. Some of the limited edition Maruti Swift includes – side skirts, a blackened C-pillar with contrasting red coloured roof, bumpers and ORVMs. The limited edition Swift also gets black racing stripes through out the body, spoilers for the rear plus the side body graphics. 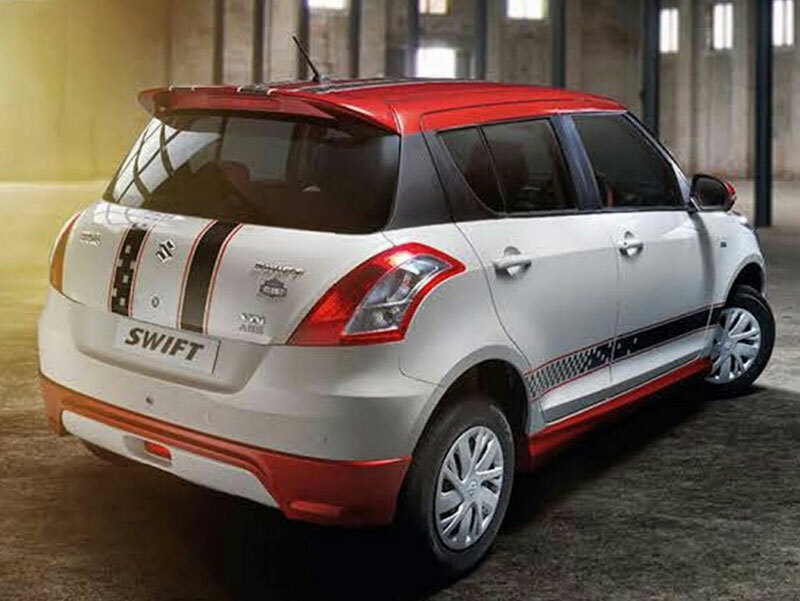 Swift’s mid-level VXi and VDi trims offers the Glory Edition pack and comes with dual-tone seat upholstery (red and black color), steering wheel and gear knob, Bluetooth connectivity for the Audio system, new floor mats and a reverse parking camera that comes with assisting rear parking sensors. When talking about the safety of limited edition Swift, though it misses out on airbags but would still be having ABS (Anti-lock Braking System) with EBD (Electronice Brakeforce distribution) as standard. The Maruti Suzuki Swift continues to be offered with 1.2 litre K-Series petrol engine as well as 1.3 litre DDiS diesel engine that is capable of churning out a maximum power of 84PS and 75PS respectively. The mileage figures for these engines are 20.4Km/L and 25.2Km/L respectively for the petrol and diesel under company testing conditions. The car comes mated to a very slick and easy shifting 5-speed manual gearbox that further enriches the sporty feel of this car. The all new Maruti Swift competes with the of the newly launched Ford Figo and Hyundai’s Elite i20. The facelift version of Maruti Ertiga is also in the carmaker’s pipeline and is expected to launch on October 10. New Baleno is expected to launch on October 26th. The new Ertiga facelift is expected to feature company’s SHVS mild hybrid system whereas the all new Baleno will be sold on Maruti’s premium NEXA dealerships. Mahindra Mojo Price to be Rs 1.8 Lakhs?